Sayfullo Saipov, an Islamic radical charged with killing eight in Manhattan in October 2017, interrupted a judge in court Friday to invoke Allah and defend the Islamic State. 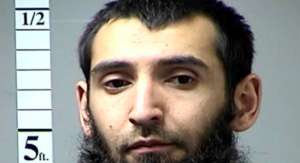 Saipov, who hails from Uzbekistan and whose name translates to “Sword of Allah,” is accused of using a rental truck on October 31, 2017, to mow down 8 people on a bike path near the World Trade Center and seriously injure dozens more. He requested permission to speak in court Friday directly after U.S. District Judge Vernon S. Broderick set the date of Saipov’s trial for October 7, 2019. Saipov, speaking through a translator, then ranted for 10 minutes about his sole devotion to Allah and to the jihad ISIS is waging. Broderick interrupted Saipov to read him his rights and to warn him that whatever he said could be used against him in court. Saipov was reportedly unfazed.